Lightning Leads to Fires in Mass. Friday's storms saw lightning strikes causing damage across Massachusetts. 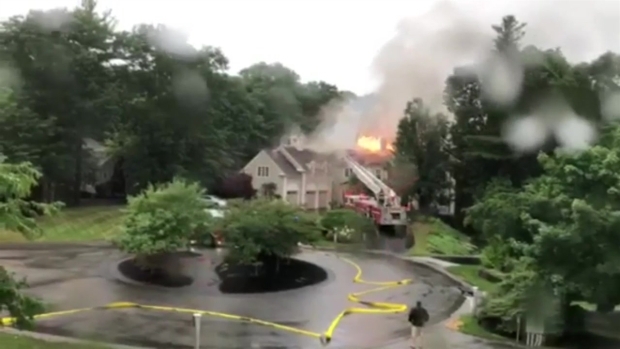 Lightning strikes sparked house fires in several Massachusetts communities on Friday afternoon as storms rolled through the region. House fires at 36 Rosemont Road in Weymouth, at 63 East Shore Road in Holbrook and a home on Edgewood Park in Norwell were all caused by lightning, according to authorities. A fire at 48 Radcliffe Road in Wellesley was believed to have been caused by lightning, as well. All of the fires were reported between noon and 1 p.m.
Holbrook resident Anthony Balbuena told NBC10 Boston he knew something happened after hearing a "big huge bang," and then ran outside to find his neighbor's shed on fire after lightning struck a tree nearby. 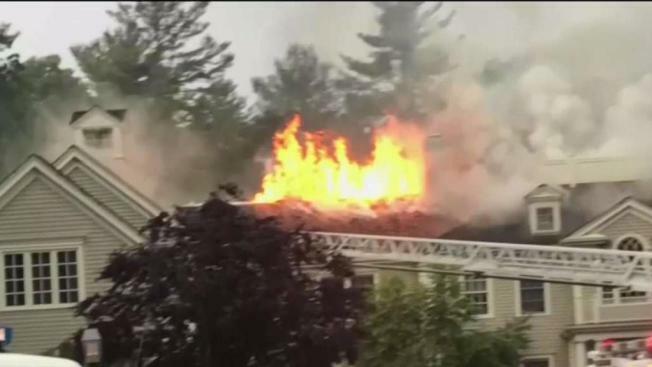 Vincent Celeste captured this video of flames shooting from the roof of a Norwell, Massachusetts house fire that was caused by a lightning strike. At that point, his young neighbor was outside with his two dogs. "It was pretty high. It was up there," he described. "Caught on quick." Several other fires have been reported due to possible lightning strikes, including in Foxboro, Needham and Beverly. But it is not yet known for sure if lightning caused those fires. Lightning strikes have also damaged numerous trees across southeastern Massachusetts. Meanwhile, safety officials are warning residents about flooded roads, including in Taunton, Braintree, Holland and Hopkinton, Massachusetts. Canton safety officials are also asking residents to avoid Elm Street at Algonquin Road after the storm knocked down live wires, causing power outages in that part of town. 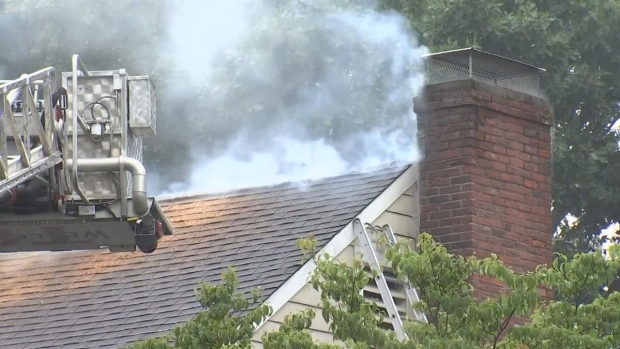 Firefighters responded to the scene of a house fire at 48 Radcliffe Road in Wellesley; the fire is believed to have been started by a lightning strike during an intense thunderstorm Friday afternoon.